Application for employment samples and templates enable the applicant’s to apply for various types of employment easily. They provide samples for a variety of jobs including teacher, driver, technician, police department, store manager and much more. They mention all the details required while applying for an employment. They help in preparing a detailed oriented job application. 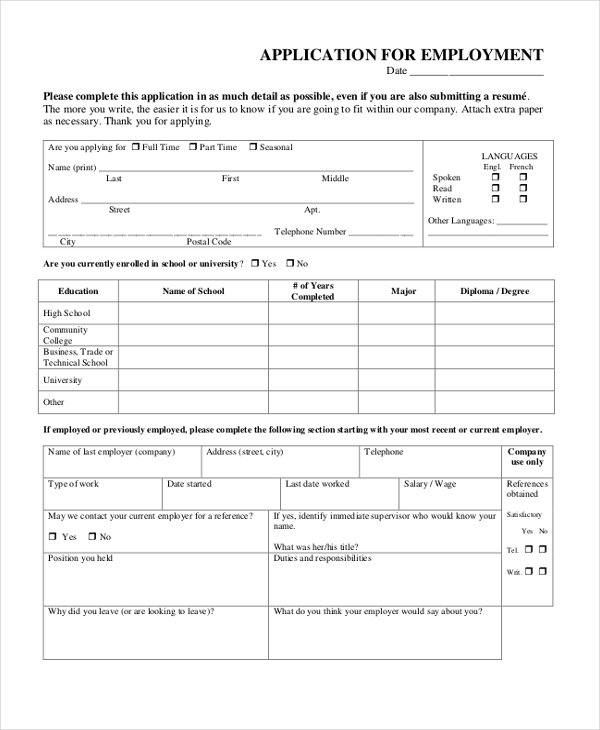 One can search Google using Application Forms, job application format, application for a job in school or job application examples and find more varieties of employment applications. This application for employment sample presents the name, address, social security number, contact number, position applied for, expected salary, desired employment type and educational details. It also mentions driver’s license details, reference details, and work experience details. 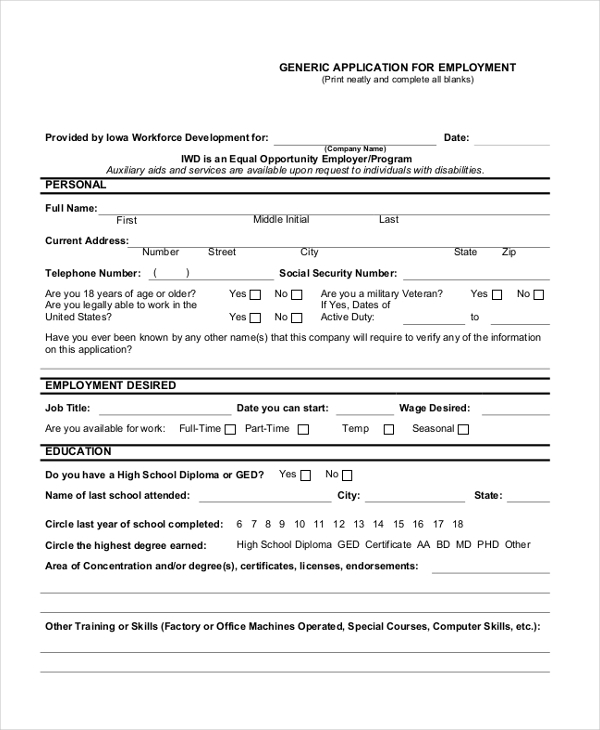 This generic employment application presents the personal information like name, address, telephone number, social security number, employment desired details like job title, date of joining, expected wage as well as educational details of the applicant. It also mentions employment history and obtains the signature of the applicant. 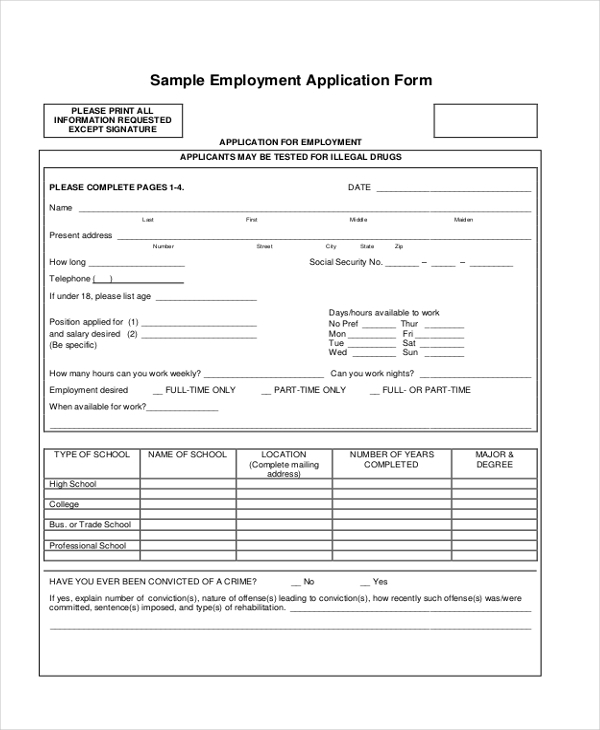 This blank employment application presents the name, address, social security number and contact number of the candidate. It mentions employment history details and general information related to the job applied for. 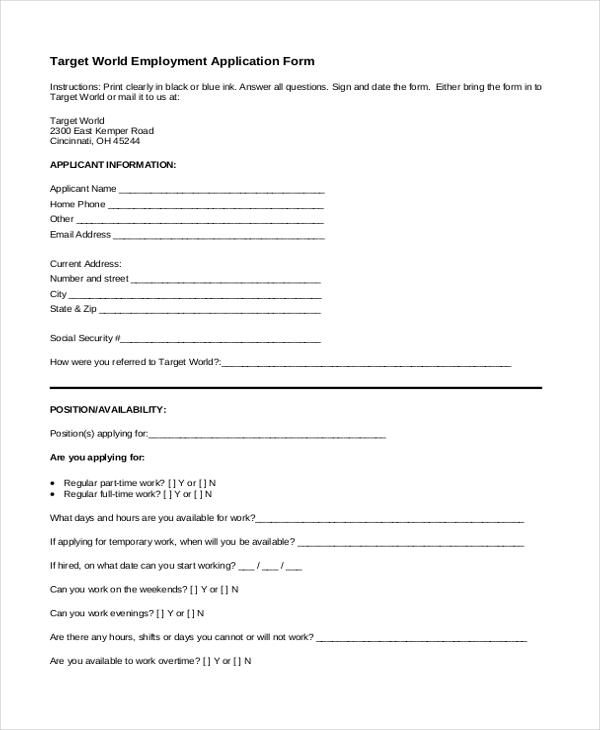 This target application for employment presents the applicant information like applicant name, home phone, email id, current address, social security number, position applied for and information related to availability for the job. This employment insurance application presents the insurance details of the employee like account number, new application and life insured details like name, address, date of birth, phone number, email id, marital status, employer name, occupation, qualification and annual income. 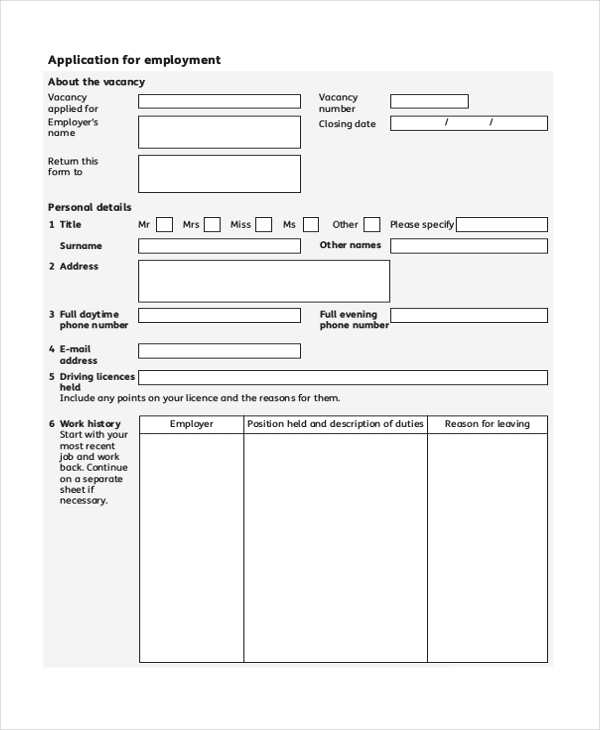 This employment job application form presents the vacancy applied for, vacancy number, employer name, closing date, personal details like name, address, phone number, email id, driving license details, work history details, educational details, references and obtains the signature of the candidate. 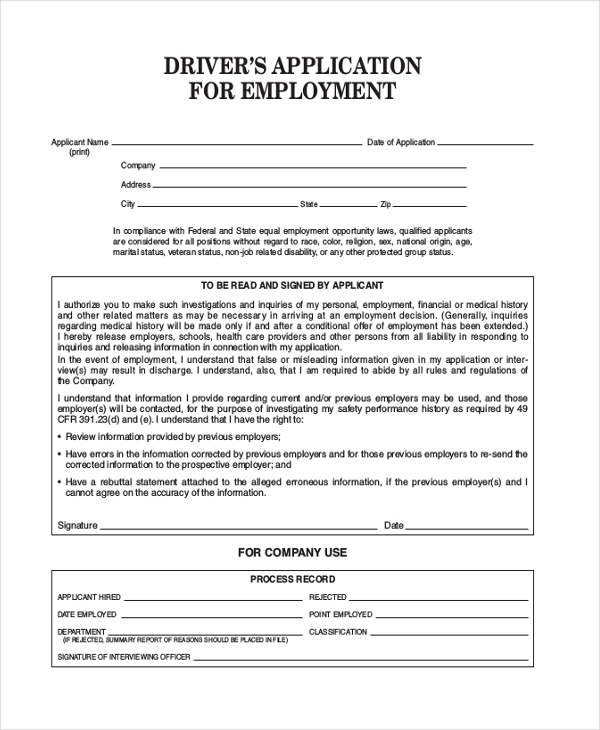 This driver application for employment presents the applicant name, company, address and obtains the signature of the applicant. 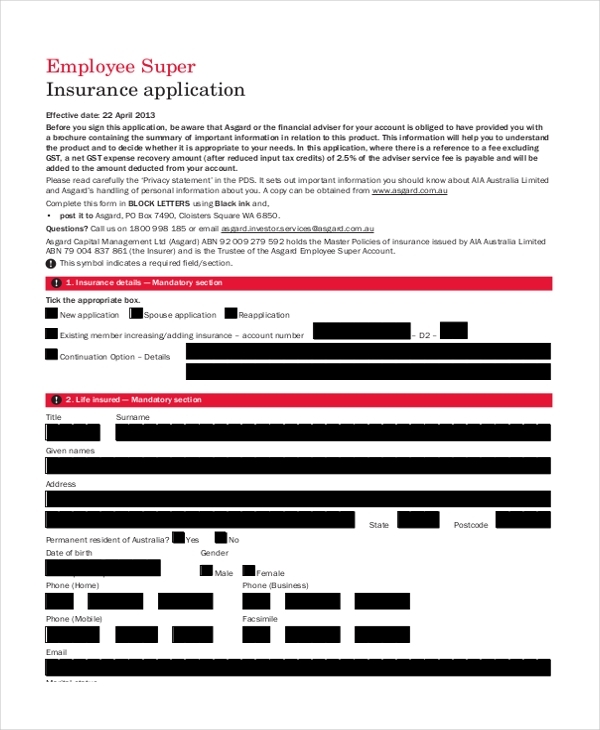 It mentions applicant’s employment history, employer details, license details and driving experience details. 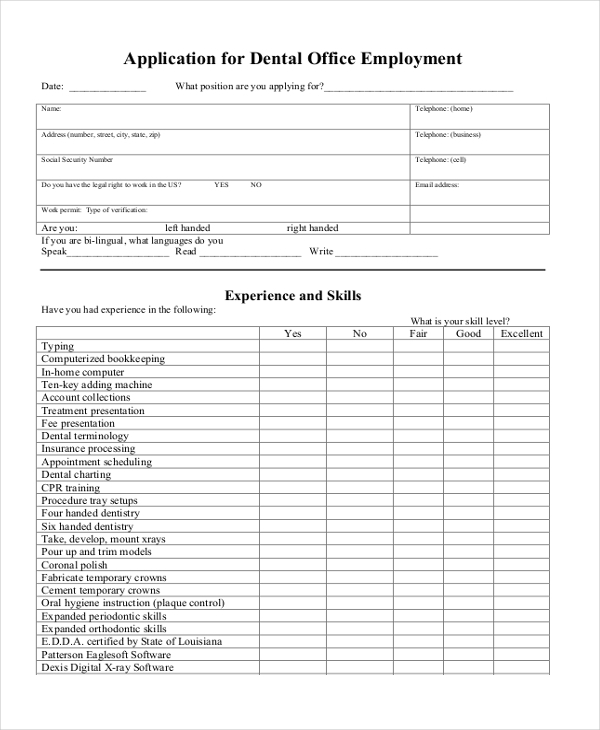 This store employment application presents the name, phone number, email id and address of the applicant. It also mentions background information, educational details, employment history, references and obtains the signature of the applicant. 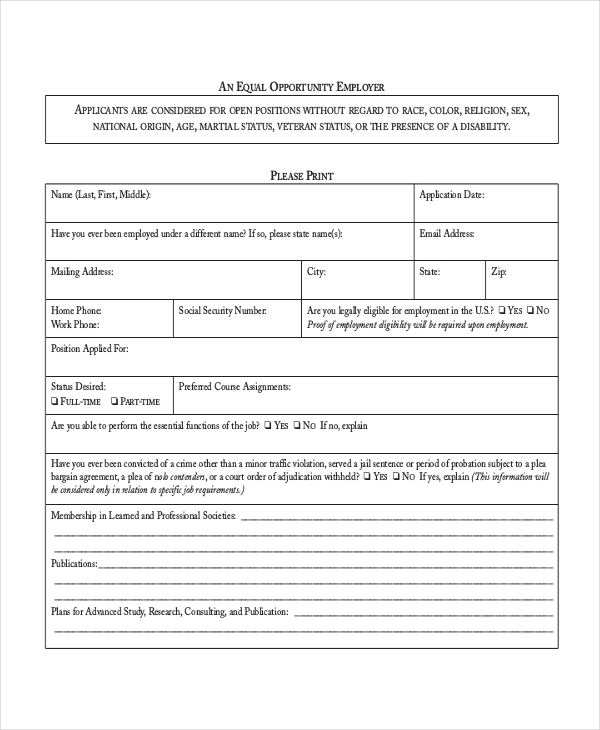 This application for employment presents the name, address, educational details, employment history and its details, availability to work details, position applied for details and obtains the signature of the candidate. 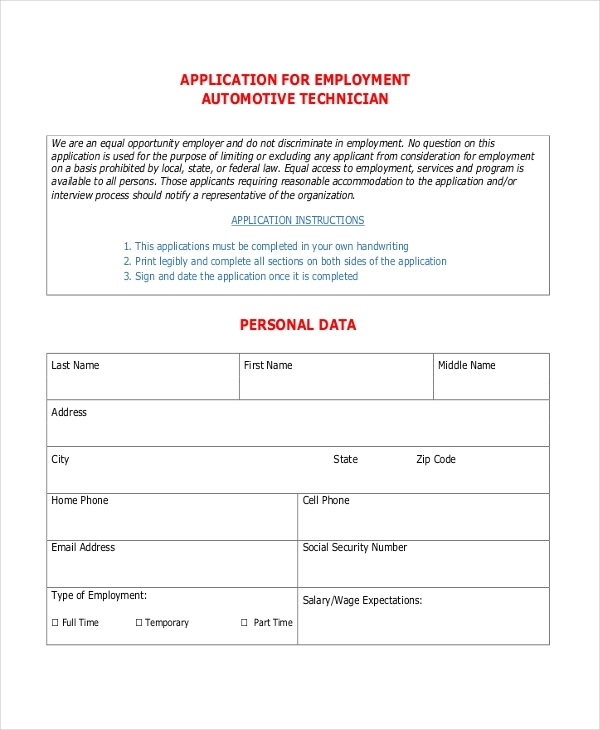 This application for technician presents the applicant name, personal information like last, first and middle name, address, phone number, email id, social security number, type of employment, salary expected, present and previous employment details, references, educational details, skill set and obtains the signature of the applicant. 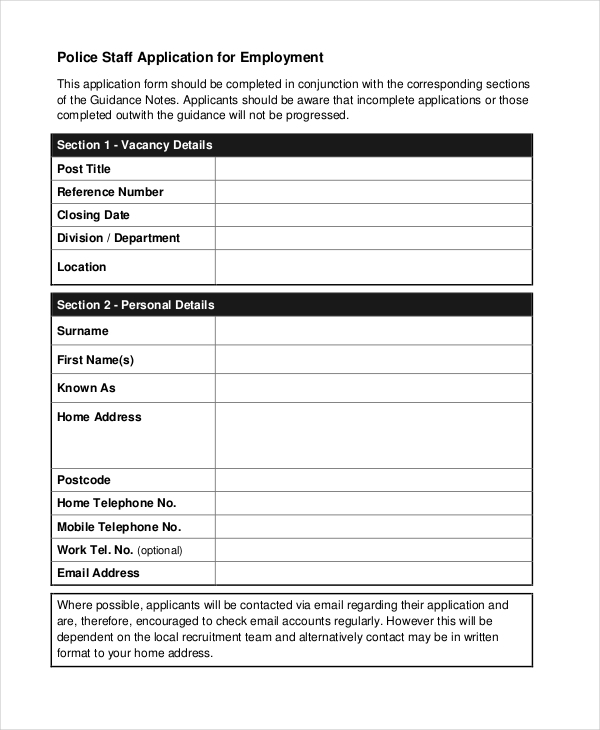 This police staff application for employment presents the vacancy details like post title, reference number, closing date, department, location and personal details like name, address, phone number, email id and passport details. It also mentions educational and employment history details and obtains the signature of the candidate. What Should be Included in Application For Employment? They are plenty of varieties of employment applications available and one can use the relevant form for the job applied for. They should include applicant details like complete name, contact information, job applied for, employer’s details and educational qualifications. They should also contain skill set details which help the hiring manager to shortlist the application. They should provide previous employment history and references as well. When one is applying for a driver job, they should include driving license details and one is applying for an overseas job, they should contain passport and visa details. They should be filled with legible handwriting and care should be taken to provide genuine details. You may also see Grant Application Forms. What are The Benefits of Application For Employment? There are enormous applications for employment forms are available on the internet and one can download them accordingly. They are extensively used by the applicants to apply for varieties of employment and get benefited. One can search Google using membership application form to apply for membership for various organizations or clubs. 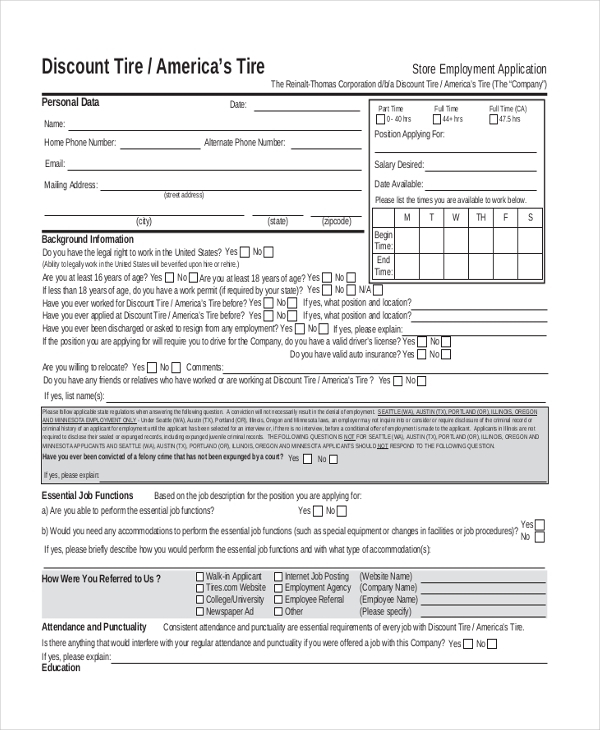 You can also see General Application Forms.